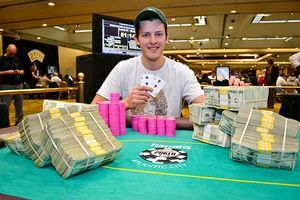 After scoring his first major win at the WPT Grand Prix de Paris, tournament poker pro Matt Waxman vaulted up the Bluff Magazine Player of the Year leader-board. Waxman has been a consistent tournament player over the past few years, but without a major tournament victory it’s hard to crack the Top 10 in the POY races. Now that he has a major win on his resume all of Waxman’s other results have put him in contention for the POY award. This entry was posted on Wednesday, September 14th, 2011 at 3:30 pm and is filed under Poker News. You can follow any responses to this entry through the RSS 2.0 feed. You can leave a response, or trackback from your own site.